Glowing Prom Flowers? Is this for real? Yes, it is! 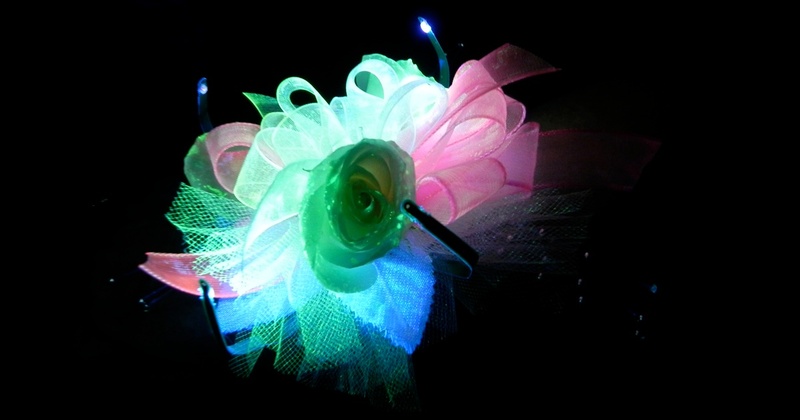 We excited to introduce Galassia Flowers Fluorescence corsages into our prom collection! This product enhances the natural beauty of flowers, and takes flower color to a new level by giving them a spectacular glow! For their beauty to be revealed, they need ultra-violet (UV) light supplied by custom-designed illumination device and a specially formulated solution applied directly to the flowers. These unique devices are imported from Adelaide, Australia- a city with a strong reputation in plant science research and development. We are honored to be one of the few florists in the United States that can provide this product to our customers! As a matter of fact, we learned about this product from networking with a florist in Las Vegas, Nevada. Galassia Corsage - Lights on in lighted room! First, we create a one of our signature corsages and design it on the Galassia bracelet with the lighted device attached. Next, we spray Galassia special formulation of fluorescence on the entire corsage. Then, when the big night arrives, the corsage is worn on the wrist, complete with an adjustable band. The device has a convenient on/off switch so you can decide when to light up the room! Galassia Corsage - Lights on in dark room! The product works best in a dark room and produces a “black light” effect. The battery life is 6-8 hours but the formulation can last for months!The photos above are showing the same corsage in a lighted room and in a darkened room. Wow! What an amazing difference! If you want the Galassia Flowers Fluorescence on your corsage, Contact us at 317.273.1100 or use our convenient Contact us form! 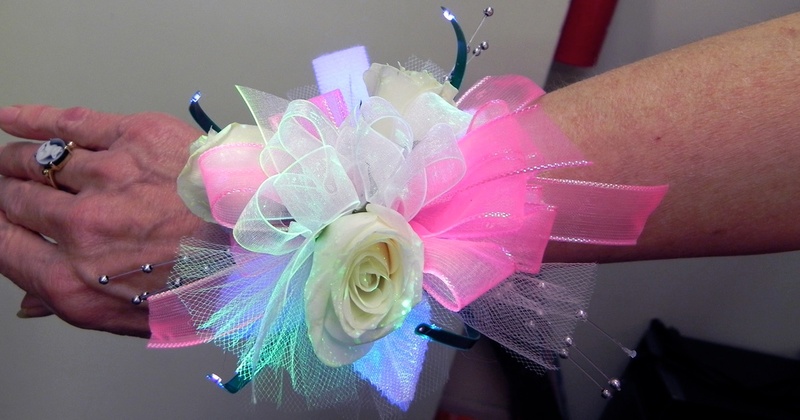 Check out this video of our glowing prom corsage in action!